Do you like the new swings? We want to make more improvements to the children's play provision and need advice from parents of school age children. Please contact Cath 07887 996293 if you can help or have ideas about what is needed. The playing field, with it's sports pavilion, tennis courts and children's play area is located at Towles Fields in Burton on the Wolds. This amenity, known officially as Burton on the Wolds Recreation Ground, is a charity, no 521399 and a Queen Elizabeth 2nd Field. The area is managed by the trustees known as the Playing Field Association (PFA). The Parish Council organise the routine maintenance for the field. If you have any concerns or comments regarding the grounds or the facilities please contact the Parish Clerk or the Chair of Trustees, number below. At the present time the field is used by two local football clubs and the Burton Tennis Club. The pavilion is available for hire for meetings, when it is not being used by the clubs. Information about the Tennis Club. Information about Emmanuel Football Club. How to hire the Pavilion. Photographs of the Playing Field. See here for more information on the history of Towles Fields Playing Field. A record of older information relating to the Playing Field. Dedication of the Memorial Stone 21st June 2015. 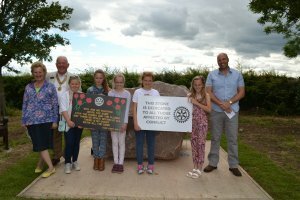 The stone was a joint project between the Burton Primary School and Loughborough Beacon Rotary Club.